Looking for the Wednesday Wandering? Just page back to come and play in the center of the galaxy where new stars – oops! I mean “words” – are born. Then join me and Alan as we pull out our machetes and venture a few steps into the complex jungle that is urban fantasy. JANE: I’m eager to continue our exploration of urban fantasy with what might be termed “classic” urban fantasy. Where would you like to start? ALAN: Well, to begin at the very beginning, I suspect that the story that probably best defines the genre is Charles Dickens’ A Christmas Carol. It has all the elements we’ve highlighted as important – the city and the people in it loom large and are the most important of the story. But the supernatural elements (the ghosts) have a large part to play in tying together the threads of the plot and bringing it to a satisfactory conclusion. 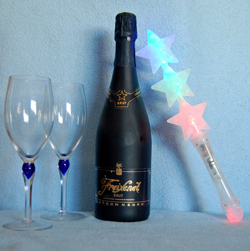 The one could not happen without the other and that, I think, is the whole secret of a successful urban fantasy. JANE: Interesting! I don’t think I would ever have thought of A Christmas Carol, but I certainly see your point. I first became aware of the term urban fantasy in the days when my novel Changer was written, but not yet published. Editors and such like kept referring to Changer as urban fantasy. I had to ask what they meant. The inevitable answer was “You know, like Charles de Lint’s stuff.” And so I finally read de Lint and immediately became a fan. Now you see why your comment last week made me grin. JANE: If I had to pull one of de Lint’s novels out of the many I’ve read as a favorite, it would be Someplace to Be Flying, but that doesn’t mean I don’t like the rest. I’m very fond of the Crow Girls, for one… For another, the cosmic level de Lint was able to take his plot without losing the very human element really impressed me. ALAN: My first de Lint novel was Moonheart which is set in the city of Ottawa. As with some of the other books we’ve discussed, it draws heavily on mythology (Celtic and Native American in this case) but it is set firmly in the modern city and tells the story through modern eyes and modern perceptions. I’d never read anything quite like it before and I was blown away by it. JANE: De Lint also has the gift of writing short stories that tie into each other so that they become more than a single story but something other than a novel. I got Jim hooked on his work with the collection Dreams Underfoot – and Jim is not usually a short fiction reader! ALAN: For me, and for a lot of people, de Lint’s most impressive work is an on-going series of novels and stories known collectively as the Newford stories. They are set in a fictional city (the eponymous Newford). Many characters (both natural and supernatural),appear again and again in the books, sometimes in major roles and sometimes as minor players and you can dip into the series almost anywhere (always a good thing about a long series). However, there is a trilogy somewhere in the middle which tells the tale of Jilly Coppercorn – an artist who has a significant role to play in the stories of some of the other Newford characters. Everyone (including me) is a little bit in love with Jilly, but in Promises to Keep, The Onion Girl, and Widdershins, we learn some of her backstory. It’s harrowing. Newford is not a real city and the supernatural elements are pure fiction but nevertheless the stories are firmly rooted in reality and Jilly’s story epitomises this. The words “Charles de Lint” and “Newford” on the cover of a book mean that I have to buy the book immediately and everything else stops until I’ve read it all the way through. JANE: Ah… Jilly! Yes. She’s a great character and her personal history, although harrowing at times, is a survivor’s tale. I sat up all night reading Onion Girl when my beloved elderly cat, Gwydion, died suddenly. Far from the dark elements of Jilly’s story making it harder for me to read, her determination was a balm for my grief. One of my personal favorite urban fantasy novels is War for the Oaks, by Emma Bull. The opening didn’t grab me, so, despite many recommendations, I didn’t read it for the longest time. Then David Weber jumped up and down and said: “So skip the opening! I promise you, you will love this book.” So I did and he was right. ALAN: I also recall that you mentioned the name Terri Windling when we were chatting. That’s not a name I’m familiar with – can you tell me a little more about her? JANE: Terri Windling is a very high profile editor. She’s less prolific these days, but for quite a long time she edited The Year’s Best Fantasy and Horror anthologies with Ellen Datlow. 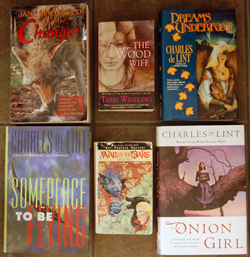 Windling also was the editor for a lot of the early urban fantasy authors. I believe she edited both Charles de Lint and Emma Bull. Additionally, she was the editor for the urban fantasy Borderland anthologies. She has a fondness for both myth and fairy tales as themes and has been responsible for a lot of the best work in those areas for many years. As a writer of fiction, Windling isn’t very prolific, but her novel The Wood Wife is an excellent urban fantasy piece. Unlike much that had been done to that point, it’s set in the American southwest, near Tucson, Arizona. Although a great deal of the action is set in the desert, there’s a distinct urban fantasy vibe to the piece. ALAN: Interesting. I wonder how she slipped underneath my radar? Obviously I need to add her to my reading list. Although the urban fantasy that we’ve been discussing here has come out of the New World, Dickens isn’t the only Old World author to write urban fantasy. There’s quite a lot of it that comes from the UK. JANE: Absolutely! Let’s touch on some of these next time. Right now, I’d better get to work. I hear a puma screaming my name! This past weekend, when some friends dropped by, conversation turned to a wedding in which one of the young ladies had been a bridesmaid the day before. She apologized for being a bit short of sleep. Apparently, the bride had wanted a say on every little detail – but had also left getting those details arranged until the last minute. 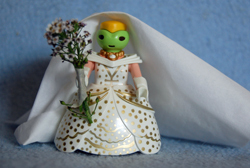 Because I love words, I started thinking about why “Bridezilla” works so well. I realized that sound is key. Both “God” and “Bride” end in a strong “d” sound. They are also single syllables, so although the words are not at all visually similar, they scan alike. This got me thinking about how many neologisms (neo = new; logism from “logos” meaning “word”) depend on this sort of sound link to catch on and enter the general vocabulary for more than a very short time. A term near and dear to our genre is “Sci-Fi.” SF Fan lore credits the origin of this word to the late Forrest J Ackerman who deliberately coined it to echo another term popular at the time: “Hi-Fi” (short for “high fidelity,” which was the “high definition” of its day). When I was getting more involved in the SF/F field back in the 1980’s, saying “Sci-Fi” rather than “SF” was considered just a little déclassé. I have no idea if the same prejudice, especially with the popularity of the “SyFy” channel, still holds. In a catalog, recently, I came across a listing for a “fandex.” This was a collection of cards fastened together at the bottom, so that they could be consulted without the need to shuffle through the cards. The source for this word was pretty obvious: fan + index, condensed into “fandex.” Will the word gain ground and enter the general vocabulary? Hard to say, but it does have the advantage of being neatly descriptive. Sometimes, neologisms evolve to such an extent that the original source becomes lost. The Watergate political scandal created a trend for dubbing first any political scandal, then any scandal at all, with a word ending in “gate.” This trend seems to have finally fallen out of use (I hope? ), possibly because the association became so attenuated with time that it lost its impact. After all, the original Watergate was nothing more than a complex that combined residential apartments and the business offices where the break-in was committed. Unlike the “ zilla” in “Bridezilla,” which alludes to a monster out of control and so has come to have a meaning of its own, “gate” doesn’t have the same associational impact. For those of us who create imaginary worlds – and sometimes imaginary languages to go with them – what it takes to make a successful neologism is worth considering. Even for those who don’t, neologisms are just plain fun. I hope you’ll share your favorite neologisms. Let’s journey through the winding maze that is a living language! Looking for the Wednesday Wandering? 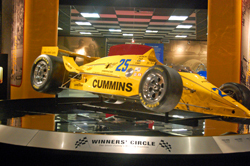 Rev your engine and take a spin around the Unser Racing Museum with me. Then join me and Alan as we venture into the mystic streets of urban fantasy. This, of course, triggered a desire in me to make urban fantasy in its various incarnations our next topic. Shall we? JANE: Even before we get into discussing specific writers, the term “urban fantasy” provides a fruitful ground for discussion. 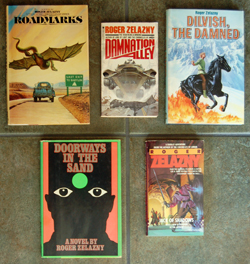 Compared to some of the sub-sections of fantasy we’ve discussed, “urban fantasy” – as a distinct term – is relatively new. Do you know when the term came commonly into use? ALAN: This is purely anecdotal, but I think I first became aware of it in the early 1990s, and the stories that brought it to my attention were mainly by Charles de Lint. JANE: I smile… You’ll see why eventually, but I want to try out a definition of urban fantasy first. 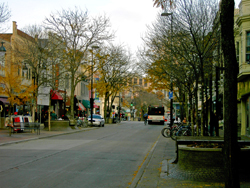 As I see it, one of the major elements of urban fantasy is that the fantasy story takes place in an urban environment. This is a great contrast to much fantasy, which is pastoral in nature. Indeed, in a great deal of traditional fantasy, cities are considered non-magical places, even antithetical to magic. 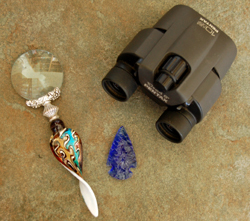 Although in urban fantasy the setting is usually contemporary, many of the magical elements draw on myth and folklore, or use traditional magical elements. Even more importantly, in urban fantasy, the magic belongs in the city. Magic isn’t reserved for a single odd shop selling magical curiosities or a cabal in hiding. In urban fantasy, the faerie folk, to cite one commonly used trope, continue live among humanity as they always have. They’ve just adapted. ALAN: You’ve hit the nail right on the head – in urban fantasy, the fantastical elements are tightly integrated into the story. They are perceived as normal and open, part of everyday life (initially they might take some of the characters by surprise, but acceptance soon follows). JANE: I mentioned above that I was rather late even being aware there was something called urban fantasy. You can imagine my confusion when, some years ago, I became aware that the types of story the term referred to had expanded. I’d been peripherally aware that once again there was a resurgence of interest in fiction about vampires and werewolves – often in a softer, more romantic mode than they had been presented in the Horror boom of the 1980’s. The term by which these stories were called initially was usually “paranormal romance.” There may have been another… Supernatural something? If so, it slips my mind. ALAN: Lovely phrase. It’s very descriptive. The first time I heard you use it, I immediately filed the serial numbers off and started using it myself. ALAN: It’s this tendency to throw the supernatural kitchen sink into the mixture and, at the same time, to de-emphasise the role that our contemporary society plays in the events of the story that makes me sneer at this kind of story. I think the strength of the genre lies in its contemporary real world setting and the fantasy elements should have a part to play in the contemporary real world problems of the characters. The further away you get from that, the more the supernatural is emphasised over the more mundane, the less convincing the story becomes. Though having said that, all is not hopeless and there are some examples of Buffy Fic that I’ve enjoyed a lot. JANE: Me, too. Well, since there seem to be two related but distinct types of fiction both being referred to as urban fantasy, maybe we can start by discussing the older variation, then move to the newer one. However, as usual, I need to go write! Let’s save this discussion for next time. Sometimes, the best thing a writer can do is push outside of his or her comfort zone and try something completely new. Automobile racing is one of many things that I’m aware exists but know almost nothing about. However, when Michael Wester suggested that we go check out the Unser Racing Museum here in Albuquerque, I was willing to give it a try. I first heard about the Unser family when I moved to Albuquerque and asked what Unser Boulevard was named for. That was when I learned that New Mexico was home to a racing dynasty that had been notable in the sport for going on four generations. Even then, my only thought was that the name explained the way some people drove down that particular road – as if they were in a race. As for the Unsers, before our trip, I couldn’t have named a single Unser, although “Al” and “Bobby” swirled up out of my subconscious as possibilities. Our visit began with Jim taking pictures of a couple of cars — one antique, one ultramodern – on display outside. We then progressed to the double door that led into the museum proper, the handles of which were shaped like a steering wheel, split down the middle. The main museum is round with six “spokes” off a central hub. The central hub is designated the Winner’s Circle and features a brilliant yellow racing car – one of those that won the Indie 500. The first spoke contains the gift shop and some small displays, including a family tree of four generations of Unsers. Flags designate those who have been involved in auto racing. There is also a magnificent piece of stained glass that I found myself thinking I wouldn’t mind having, even if the subject was a racing car. The first hub has a few displays, but most are reserved for the other five hubs. The displays in the first hub center around the Pike’s Peak race. This is the race that infused the Unser family members with their enthusiasm for racing. Rather than going around and around a track, this race goes up a very steep mountain and features some hairpin curves that nearly double back onto themselves. As if this isn’t terrifying enough, until recently, the track was dirt. The Unsers have won this race so many times that in racing circles Pike’s Peak is often called “Unser’s Mountain.” Nor do they always compete in the same type of car or class of race. One of the more recent victories was by Jeri Unser (a fourth generation and the only female to take up racing) in an electric car. Her time was so good that she beat many gas-fueled vehicles. The second spoke was devoted to the Indianapolis 500. What was really cool about this room was that it didn’t just focus on the race, it focused on the technology of the cars. It’s one thing to look at a low slung, smooth-tired car and admire its lines. It’s much more fun when there are displays (and all the displays at the Unser Museum were excellent) to explain why the cars are built that way and what advances have been made over time. An added flourish for a novice like myself was an explanation of what pit crews do and how crucial their contributions are to success or failure in the race. The third spoke was called Jerry’s Garage. When the Unsers first came to New Mexico, they ran a gas station and garage. This garage is where the “boys” not only learned to drive, but often built their own cars. I was really impressed to find out that many of the Unser drivers were also mechanics and engineers, so they understood their cars from the tires up. In one anecdote, am Unser associate talked about seeing the flash of a diamond Indie ring on the finger of the Unser who was, at that moment, helping him grub through the engine of his car. Throughout the displays, there had been a lot of stress laid on the competitive spirit of the Unsers, both with other drivers and with members of their own family. It was rather nice to see this balanced by some less competitive qualities as well. The fourth spoke was devoted to racing fans. The walls were lined with handmade quilts, and the displays included gifts made by fans and given to the Unsers. Particularly flashy was a black and white checked guitar from Nashville. However, just in case you forget that this museum is all about cars, a Model A Ford in beautiful condition dominated the center of the room. The fifth centered around some very cool educational displays, including an array of engines with explanations about how they worked. There were interactive touch screens on which you could quiz yourself on race car lore – including how the tracks are set up, the technology, and even the role played by the weather. The crown jewel of this room was a high class racing simulator, realistic enough that I found myself jumping whenever the car got a little too close to the walls or another vehicle. After Jim and Michael both had a chance at the racing simulator, we went over to Unser Two. This building contains a selection of both racing and antique cars. I haven’t mentioned something really special about this museum. The vehicles aren’t behind ropes. You can walk right up to them and peer inside the cabs. Visitors are asked not to touch the cars – which are polished to a perfect gloss. Given the lack of fingerprints, I think this wish was respected. Unser Two also contained a display room containing hundreds of racing trophies – and these were only some of those earned by the members of the Unser family. In addition to the usual cups and engraved plaques, there were some beautiful works of art, including a miniature Japanese samurai helmet and race cars sculpted from what looked like gold wire. There were a selection of champagne bottles and a milk bottle… This last would have puzzled me greatly, but I’d learned that a bottle of buttermilk is traditionally presented to the winner of the Indie 500. There was also a small gallery of racing related art, some of which was surprisingly good. I think my favorite there was a painting with repeated renditions of the Indie “Marlboro” car that made me think of folded origami figures, rather than automobiles. After we left, we all agreed that the museum had been a lot more fun than any of us had anticipated. I found myself wanting to read a book about the Unsers and wishing that I’d had energy to stand and read some of the longer touch screen presentations. As a writer, I was reminded how good it is to push my limits. Too often it’s easy to only do things you know in advance you’ll enjoy. Far more creatively stimulating is pushing your horizons. Maybe what you learn won’t show up in a story right away, but someday it will, making you very glad you made the effort. A wander from my Wandering before I even get into it. Tomorrow evening (6:30, Thursday, June 13th), I’m doing a book signing at Alamosa Books here in Albuquerque with Darynda Jones and Shea Berkley. Although the official focus will be our various YA projects, I’m sure other works will be discussed as well. I hope some of you will be able to drop by. As I mentioned last week, I’ve finally found my way into the sequel to Artemis Awakening (to be released May of 2014). First, without giving any spoilers, I can safely state that Artemis Awakening has two point of view characters. As I worked my way into the sequel, I realized that this book demanded a third. Why? If I tell the honest truth and say because it “felt right,” you’d be justified in wanting to roll your eyes in frustration. So, although that’s perfectly true – I have been writing for publication for over twenty years now, and decisions I used to work my way through have become reflex – I’m going to try to explain a little about the criteria I use to decide how many points of view a book needs. The first element to consider is what narrative voice I’m using to write. If it’s first person (“I”), then I usually stick with one point of view. I have read books that work with two or more “I” narrators, but usually that’s not a choice I make. One of the reasons I write first person is I want to be locked into one point of view. If I feel the book needs more than one point of view, then I shift to third person. I think of this as a “fan” structure, because as the plot unfolds, so does the number of point of view characters. Too often, authors introduce all the point of view characters in the first few chapters, whether or not they’re needed. This can keep the reader from getting involved with the story, because of all the skipping around for no apparent reason. Q: So, how many point of view characters does a novel need? A: As many as it needs. Seriously… Some stories need only one point of view character. My novel Child of a Rainless Year does just fine with only Mira’s POV. (Although her aunt’s journal entries could be considered another point of view, I suppose.) So does Brother to Dragons, Companion to Owls. However, it was suggested to me that Marks of our Brothers (my second published novel) might have benefited from an additional POV, that the tension could have been heightened if the reader – although not necessarily the characters – had a better idea what the bad guys were plotting. Maybe so… Certainly, David Weber gets a lot of mileage out of giving the reader both sides of a conflict, so that the reader knows who is planning what and what errors each side is about to make because of ignorance regarding the complexities of the situation. There’s definitely an advantage to this choice if building tension important to the story. Another reason for more than one POV is to permit “showing” rather than “telling” about various events. A good example of this is Tolkien’s novel The Two Towers, where events separated by distance are told each as their own story, rather than having one set reported upon at some later date. However, for me, distance alone is not enough reason for adding another point of view. What I really enjoy is becoming immersed in the different ways two people who might be within touching distance perceive the same event or other characters. Here’s a great exercise if you want to explore the impact of point of view on a story. Take a section from a book you know well, then retell the action from the different points of view. Let’s use the journey through the Mines of Moria from Tolkien’s The Fellowship of the Ring. Tolkien tells this mostly from the point of view of an omniscient narrator, although occasionally he dips into Frodo’s POV, usually when he wants to add some emotion. Now, sink yourself into each character and tell that section from the different point of view. Gimli would be initially optimistic, then apprehensive, then what? Frightened? Vengeful? His point of view of current events would be colored by “I remember when…” “I had hoped…” with every step, every new piece of information. Gandalf… Does he sense the evil still lurking? Does he realize that they are in a death trap – a death trap that he suggested they enter? How does this color his reactions to the place? Remember, he’s also the leader, so he’s going to be worried about his followers, not just himself. Legolas? Go beyond the cliché “elves and dwarves don’t get along.” He’s seen the carved door with its hints of old friendship between the races. Would he mull over how time has changed relations? Is this, perhaps, the turning point in his own relationship with Gimli? How about the humans? How do they feel about these dwarven tunnels? Cramped? Claustrophobic? Do they feel their relative youth as a race? Would Boromir and Aragorn think the same way? Why not? How would these differences color how they see what is precisely the same place? The Hobbits would probably be delighted to be underground, yet frightened by the death and destruction surrounding them. Again, would Frodo, with his greater education and sense of history, see things differently from the younger hobbits? How would Sam’s soul – so romantic, yet so practical – color his view of the place? How about Merry and Pippin? Does their reaction go beyond relief at being out of the snow? Do they differ from each other in any way? These differences are among the reasons I usually prefer writing from the point of view of one or more characters, rather than from that of an omniscient narrator. Point of view can add richness and spice. It can add character to events that otherwise could become nothing more than plodding plot. Like any spice, point of view should be handled with precision and care but, without it, I find that the most exciting story can become bland. Now… Off to find out what my newly added point of view character has to say… He’s a bit creepy, but I think it’s going to be interesting to see what’s going on inside his head. A Toast to Two Years! join Alan and me as we celebrate two years of nattering on about anything and everything. ALAN: Well, Jane, we’ve been exploring tangents for two years now. I don’t know about you, but I’m still having lots of fun. JANE: Oh, I agree. Every time we think we’ve run out of things to talk about, something new comes up. I’ve gotten to the point that I’d seriously miss these discussions. ALAN: One of the more surreal aspects of writing these things is that, although you and I haven’t met in person for eighteen years or so, we still find it so very easy to talk to each other. Scarcely a day goes by without an exchange of emails. JANE: I agree about this relationship being rather surreal. I was saying to Jim the other day that I wouldn’t know the sound of your voice and, since you’re as camera shy as I am, I could probably walk past you at a convention without knowing you. However, our chats ‑ both those that become Tangents and those on other matters ‑ have become pulse points in my day. ALAN: I’m the one who keeps winning the George R. R. Martin look‑alike competition. You’re the one with the wolf and the ecstatic expression. Easy! JANE: I still see problems. I know George fairly well, so I probably wouldn’t mistake you for him… And I never have a wolf with me at conventions. I fear we’d be ships passing in the night. Another oddity is that, although we exchange e‑mails on a nearly daily basis, those days are often not the same day. If I’m writing you in the afternoon, especially, the 18 hour time difference means that even when your reply comes within moments, you’re writing me on the next day. I feel as if I’m corresponding with the future. JANE: If you can figure out the results for the lottery here, I’m all for it. I’d even split the take with you and Robin! I will admit, although you’ve been a very good influence on me overall, you have played havoc with my already challenged spelling. I keep fighting an urge to add “u” to words like “humor” and “favor.” My computer’s spell check is constantly trying to get me to Americanize your spelling, but I refuse. Paul Dellinger, who proofs for us, is very patient in preserving the differences in our spelling and punctuation, something I like because it provides a tacit reminder of our different cultures. ALAN: Well, since you don’t need to use ‘u’ very often, would you care to send me some? You must have a lot to spare, and I’m starting to run out. On a more serious note, one of the things I’ve really appreciated about what we’ve been doing is the insight you’ve given me about the way your “foreign” society works. We have a lot of similarities, as you might expect because of our shared European roots, but we also have a lot of differences as well. Pinning these down has been truly fascinating. JANE: Yes! That’s something I’ve enjoyed as well. Although often our topics have been light ‑ two years ago, we started with names for items of clothing ‑ we’ve managed to tackle some serious subjects as well: voting practices, medical care, and education systems all spring to mind immediately. ALAN: And naked ladies. Don’t forget the naked ladies! Of course we’ve also spoken a lot about books; our mutual obsession. That’s been useful as well as fun in that you’ve introduced me to writers who I might not otherwise have stumbled upon. I read The Secret Garden by Frances Hodgson Burnett so I could discuss the Yorkshire aspects of it with you. I enjoyed it a lot more than I expected to. Excellent book! You also introduced me to Jacqueline Winspear’s “Maisie Dobbs” novels, which I absolutely loved. JANE: The same for me… I spent a happy week or so immersed in the complexities of James Blish’s Cities in Flight based on your enthusiasm. And I read Jack Vance’s Space Opera. Most recently, I read Harry Harrison’s The Technicolor Time Machine, because you mentioned it. ALAN: Technicolor ‑ amusingly the British edition retained the American spelling on the cover. But the audio book, which was produced by an American company, used the British spelling – “technicolour.” How weird is that? ALAN: A question that I know both of us have been asked is whether or not these tangents are real discussions. And of course the answer is yes. They derive quite naturally from email conversations that we have. We certainly edit and polish and rearrange the bits and pieces, but even as we are writing them, the early drafts are full of gaps where the other person can make a contribution. And sometimes that contribution sends the conversation off in all kinds of unexpected directions. Just like in real life. In fact, we often have so much to say on a given topic that we need to sub‑divide, which is why one topic may stretch out over several weeks. Really, it’s been a tremendous amount of fun. This past week I started the sequel to Artemis Awakening. This is a big deal, an event to be celebrated with ice cream, preferably chocolate. But, by then, a couple of weeks had gone by, weeks that I’d spent in another universe with other people. That didn’t exactly make it easier to “hear” Adara and Griffin and Terrell and Sand Shadow, nor to “see” their world and their particular situation. I kept trying, but nothing was coming forth. Alan and I wrote back and forth a lot about other people’s stories, so I wasn’t exactly unproductive, but AA2 still was more theoretical than a reality. As I’ve mentioned a few times, I’m a subconscious plotter. I don’t outline. If I try, all that happens is that inspiration rolls over and dies, like a butterfly with a pin through its heart. This can be frustrating but, after 22 published novels and 60 some short stories, I’ve learned not to fight it. What gave me my breakthrough? 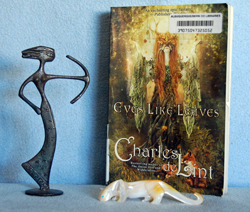 Well, the novel I’m currently reading is Eyes Like Leaves, by Charles de Lint. It’s an odd book because, although it was written sometime in 1980, it was not published until 2012. (If you want to know why, go read Charles’ excellent introduction to the novel. It’s worth it, especially as a window into the conflicting and complementary forces of market and art.) Charles says he did not heavily revise that long-ago manuscript, but he did polish. His biggest change was rewriting the opening chapter. He included the original version as an “extra” at the end. It was in de Lint’s short introduction to this “extra” that I found the key to open my mental door. When I read this, I found myself getting all excited. Remember how I said that maybe it was because I had so many ideas about AA2 and where it was going that I was having trouble starting? Maybe I was trying to put too much in? Certainly, because I’d spent much of the last couple of months mostly in editorial mode (both with Artemis Awakening and Treecat Wars), rather than in creative mode, I was thinking in a very pragmatic fashion. I decided that, instead of thinking about foundations, I should go to where the story started. Almost as soon as I made that decision, I heard my characters talking. So, thank you, Charles, and thank you, Lawrence Block. And thank you, Griffin and Terrell and Adara. I can’t wait to see where we’re going next.